With our online portal, you can create professional looking sales invoices with your company logo. You can either print them from a PDF or email them directly to your clients. You can also chase payments and issue credit notes to rectify errors you have made on previous invoices. Open the Invoicing tab. You will be presented with a dashboard. Export Invoices - allows you to export your invoice details to an Excel document. 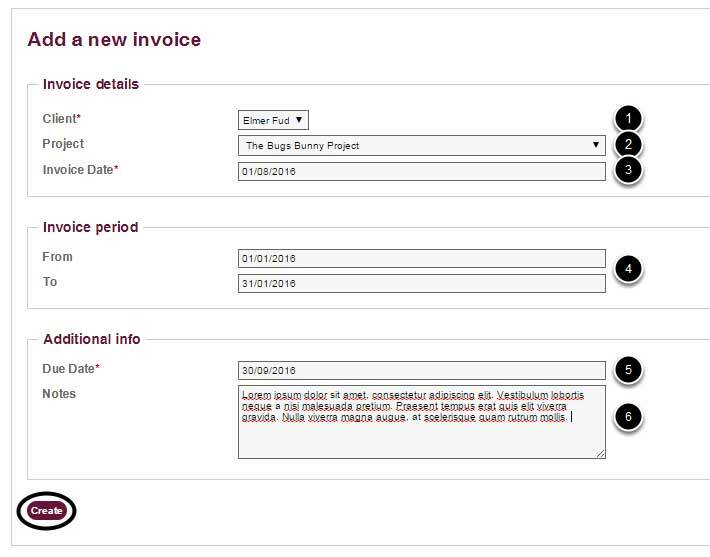 Enter your invoice details into the form and click the Create button to save. Client – if your client does not appear in the list, please see Clients & Projects - How to Add a Client) to learn how to add them to the portal. Project – select the project the invoice is associated with or leave blank if not applicable. Invoice Date – enter the date the invoice was prepared. Invoice Period – specify the start and end date of the invoicing period (optional). Due Date – specify a payment deadline. Notes – add a note to the invoice (optional). You will arrive at the Add / Edit invoice page. Click the Invoice Items dropdown box and select your rate (if you've set one up) or manually enter the details (see Step 6. Enter the total amount of units you have worked on the project in the Qty field. This will populate the Cost, VAT and Line Total fields with calculated figures. Units – specify how you spent your time working on the project. Description – give your invoice a description. Qty – enter the total amount of units you spent working on the project. Unit Price (£) – enter the price per unit. Cost (£) – this field will display the total amount owed excluding VAT (after you enter the unit price). VAT (£) – this field will display the amount of VAT charged to the invoice (after you enter the unit price). Line Total (£) – this field will display the total amount owed including VAT (after you enter the unit price). Click the Add line button under the Options column to add the item to the invoice. NOTE: Please ensure you click the Add Line button each time you add an item to an invoice, otherwise it will fail to save. The item will appear below the form once it has been successfully added. 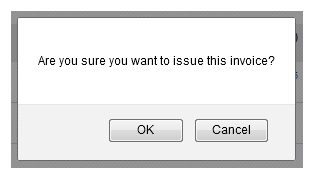 Remove – click this button to delete the item from the invoice. A pop up box will appear on screen listing all of the expenses relating to the project. Use the checkboxes to select which expenses you wish to add to the invoice and then click the Add To Invoice button to save. You will see the items appear in the Expenses section of the page. Remove – click this link to delete the expense from the invoice. A pop up box will appear on screen listing all of the mileage expenses relating to the project. Use the checkboxes to select which expenses you wish to add to the invoice and then click the Add To Invoice button to save. You will see the items appear in the Mileages section of the page. Save Draft Invoice - select if the invoice is incomplete and requires further editing (see Step 16). Save and Issue Final Invoice - select if the invoice is complete and ready for submission (see Step 17). The invoice will display below the Drafts tab on the Invoicing dashboard to confirm it has been successfully added to the portal. Edit - Allows you to make changes to the invoice. PDF - Allows you to create a PDF version of the invoice (see Step 18 for details on how to create invoice PDFs). Issue - Allows you to issue the invoice to the client. Click the Save and Submit Final Invoice button if you're ready to issue your invoice. NOTE: Once an invoice has been issued, it cannot be deleted from the portal. A pop up will appear and provide you with some options of how you can issue your invoice. Include itemised breakdown of expenses/mileages - Tick this box to include an itemised breakdown of the expenses/mileage expenses in your invoice. Leave it unticked to include just a summary. 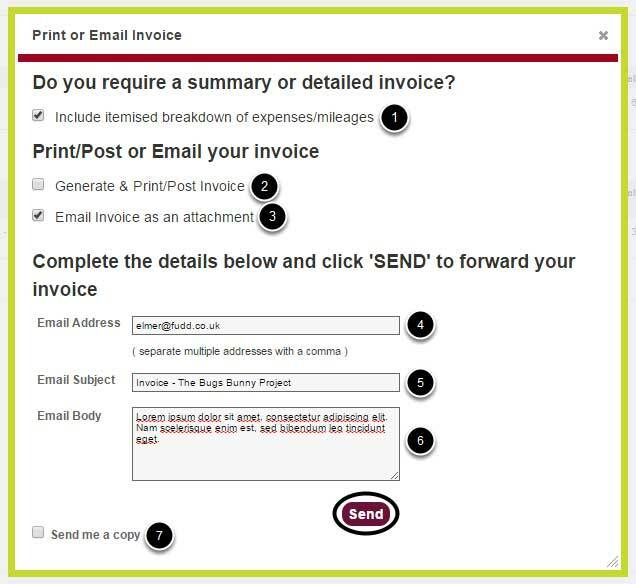 Generate & Print/Post Invoice - Tick this box to generate a PDF version of your invoice. Email invoice as an attachment - tick this box to email the invoice as an attachment to the client. If you opt to email the invoice as an attachment, a form will appear below the checkbox requesting your client's email address. Email Subject - enter a subject line to describe the contents of the email. Email Body - use the email body to reference the attached invoice. Send me a copy - tick this box to send a copy of the invoice to your email address. Once submitted, the invoice will move from the Draft tab to the Outstanding tab on the invoicing dashboard. PAY - Allows you to add an invoice payment to the portal (see Invoicing & Payments - How to Add an Invoice Payment for more help). Credit - Allows you to issue a credit note to the client to rectify any errors on the invoice (see Invoicing & Payments - How to Issue a Credit Note for help). 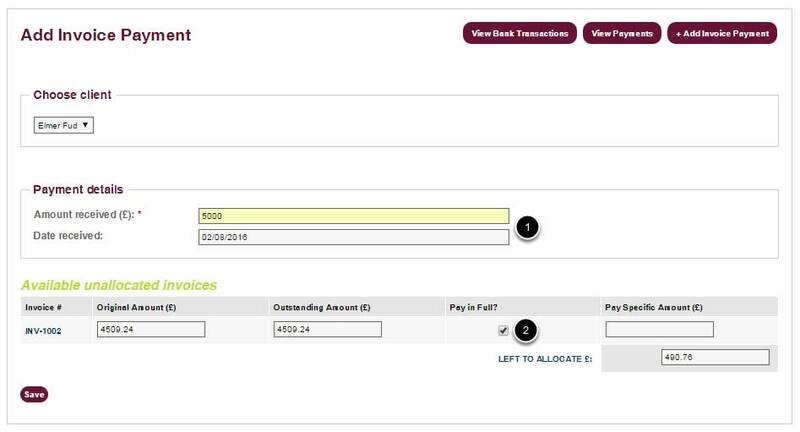 Use the tabs to find the invoice you wish to add a payment to and click the PAY link under the Options column. Use the dropdown box to choose the client you wish to add a payment to. A short form will drop down below. Enter the amount received and the date it entered your bank account. Tick the Pay in Full? checkbox if the invoice has been paid in full or enter the amount received in the field below the Pay Specific Amount column. Your remaining balance will display in the Left to Allocate field. If you are happy to proceed, click the Save button at the bottom of the form. You will be redirected to the Invoice Payments screen. Delete - removes the payment from the portal completely. Allocate - looks to see if there are anymore available unallocated invoices relating to the client. Unallocate - removes the payment from the portal and reverts the Amount Received back to its original value. Unallocated Amount - the amount you have remaining after the invoice has been allocated. NOTE: To verify the payment has been successfully allocated, open Invoicing and click the Paid tab. See Invoicing & Payments - How to Add an Invoice for more help. Use the tabs to find the invoice you wish to credit and click the Credit link under the Options column. 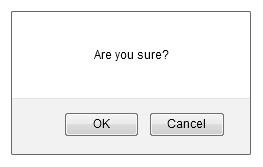 A pop up message will appear on screen asking if you are sure you want to proceed. Click OK.
A message will appear at the top of the screen confirming the invoice has been credited and moved to the Credit Notes tab. Open the Credit Notes tab. 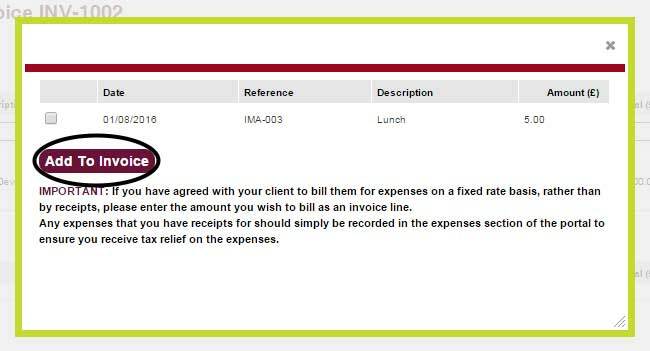 If you would like to send the credited invoice as a PDF to the client (to confirm it has been credited), click the PDF link under the Options column and follow the instructions on screen (or see Invoicing & Payments - How to Add an Invoice, Step 18 for help). If you would like to reissue the invoice, please repeat Invoicing & Payments - How to Add an Invoice, Step 16.